If only this were as easy as herding cats! 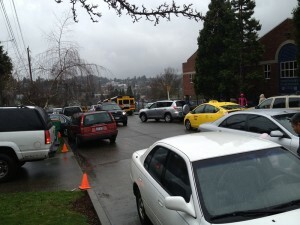 When the bell rings, most every parent aims to have their car at the same place at the same time; with the intention to be as close as possible to the front door. Combined with equally pressing needs to, get to work on time, or perhaps make an important phone call, driving behavior near schools can make your heart skip a beat. 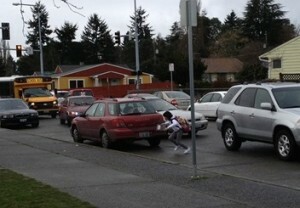 Small children are let out in traffic or waved across the street mid-block, while drivers back up, make U-turns, or otherwise maneuver to get to their coveted spot. To make matters worse, a 2009 study by Safe Kids USA found that the rate of distracted driving is higher in school zones than it is on other neighborhood roads. Over the past 4 years, Feet First has worked with several schools to assess and improve student safety during arrival and departure. Recent evaluations have shown some improvements to crow about. At partner school Olympic Hills Elementary, a simple A-frame sign helped reduce U-turns by more than 50 percent (from 30 to 14). At Dearborn Park Elementary, reducing a drop-off loop to one lane from two means that students no longer walk through moving traffic to reach the curb. At Concord International School in South Park, separating the bus zone from the parent pick-up location dramatically reduced incidences of students crossing the street through moving traffic. Combined with efforts to encourage more students walking and biking, these schools have made impressive strides towards being safer during arrival and departure. Feet First (with help from the Seattle Department of Transportation and Toole Design Group, and with funding from the Washington State Department of Transportation) has been developing and testing tools to quantify the dangers to students, implement plans to increase pedestrian safety, and then measure the results. Our Arrival and Departure Improvement Handbook will be released in August 2014. To receive a notification when it is complete, contact Jen Cole, Safe Routes to School Program Director by emailing jen@feetfirst.org or calling 206-652-2310 ext. 2. If your school is looking for a new approach to tame traffic around schools contact us.